Delicious & nutritious! Nutritionally dense to support a balanced diet & active lifestyle! Nurture by nature. Healthy super foods. Fibre per 30g 5.4g. Omega 3 ALA per 30g 4.38g. Source of magnesium and selenium. Gluten, dairy, yeast and GMO free. No added sugar - contains naturally occurring sugars. 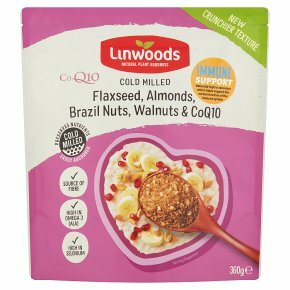 Suitable for coeliacs, vegetarians and vegans diets.A scrumptious blend of flaxseed and nuts with the addition of Co-Enzyme Q10 makes this a unique blend packed with nutritional goodness. Whether you are adding to porridge or cereal, stirring into yoghurt, or sprinkling on a salad, simply adding a spoonful or two gives your meal a nutrient-packed pick me up! Co-Q10 occurs naturally in the body but natural production declines with age and so dietary sources are important to help maintain adequate levels. Our healthy super foods are cold milled to aid quick and easy absorption into the body, so you can feel the immediate nutritional benefit in your diet, naturally. Health Benefits Include: Omega 3 (ALA) - Essential fatty acid which contributes to the maintenance of normal blood cholesterol levels. Selenium - Required for the normal function of the immune system and to provide protection of cells and tissues from oxidative damage. Iron - Important for oxygen transport in the body and the formation of red blood cells. Zinc - Necessary for immune system function and antioxidant protection of body cells and tissues from oxidative stress. Magnesium - Beneficial for healthy bones and teeth and aids in proper muscle function, nervous system function and energy metabolism. Add to any meal at any time of the day: Breakfast - Jump start your day, add to: Porridge, Hot or Cold Cereals, Granola, Muffins, Yoghurt, Fruit, Fruit or Vegetable Smoothies, Fruit Juice, Scrambled Eggs. Lunch - For a delicious and nutritious lunch add to: Salads, Soup, Yoghurt, Fruit, Sandwiches, Salad Dressing, Cottage Cheese, Wraps. Dinner - For a nutritious and tasty boost to your evening meal, add to: Stir-fry, Casseroles, Curry, Omelette, Sauces, Pasta, Rice Dishes, Casseroles, Stuffing, Sauces, Cous Cous, Baked Potatoes. Add to any meal or snack or when baking! 30g = two heaped dessert spoonfuls.